Description via Amazon: Joy, peace, and power---these are only some of the gifts promised to those who trust in the name of the Lord. Praying the Names of Jesus will lead readers into a richer and more rewarding relationship with Christ by helping them to understand and to pray his names on a daily basis. By understanding the biblical context in which these names and titles were revealed, readers will gain a more intimate knowledge of Jesus and of his plan for their lives. They will also begin to see how each of his names holds within it a promise: to be our Teacher, Healer, Friend, and Lord---to be God with Us no matter the circumstances. Prince of Peace, Lamb of God, Bread of Life, Yeshua... through his names and titles, we come to understand more fully how Jesus reveals God's heart to us. Praying the Names of Jesus focuses on twenty-six of his most prominent names and titles to provide six-months worth of devotions. Each week provides a unique devotional program designed for personal prayer and study or for use in small groups. 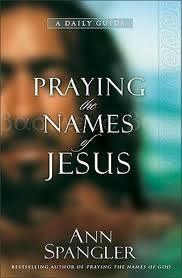 Praying the Names of Jesus is the companion volume to the bestselling Praying the Names of God. In ways both surprising and profound it reveals a rich portrait of Jesus that will move readers toward a deeper experience of his love and mercy. As the description above states, Praying the Names of Jesus takes 26 names/titles of Jesus designed to take one name and reflect on that name over the week. Each chapter starts off with a brief description of the name for the week. Monday's study is called "His Name Revealed" and gives background informaiton and a short study; Tuesday's through Thursday's study is called "Praying the Name" and includes sections for each day on reflection, praise, gratitude, confession, and requests; and Friday's study is called "Promises Associated with His Name" where comforting promises in Scripture are given for your encouragement and continuing growth of your prayer life. Praying the Names of Jesus was a really effectve and inspiring book. It was recommended to me by my friend Jennifer along with the companion Praying the Names of God. I haven't had the opportunity to begin Praying the Names of God yet, but based on what I've experienced through this book, I'm definitely adding that one to my To Be Read (TBR) list. Focusing on an individual name for Jesus gives us a deeper understanding and appreciation for the magnitude of our Savior. He encompasses so many characteristics and all of them amazing and above our complete comprehension. Anytime we can deepend our understanding of God, we realize how big, magnificient, and great (these descriptions just don't do Him justice) He is. And thus in return, we properly view ourselves in relation to Him, which ultimately humbles us. And as a result of increasing our view of God and humbling ourselves, we draw closer to Him. Any book that can help encourage and increase our view of God while decreasing our view of ourselves, and therefore, draw us closer to our Creator, well that deserves not just a read, but a study. Check it out, I think it'll be worth your time.